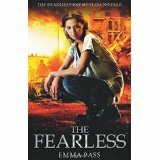 Emma Pass has been making up stories for as long as she can remember; she reckons it’s the most fun you can have without attracting attention from the authorities. She wrote her first novel, aged 13, in maths lessons with her notebook hidden under her work. After school, she went to art college, but soon realised she wasn’t cut out to be a painter and decided to stick with writing. By day, Emma works as a library assistant and lives with her husband and crazy greyhound G-Dog in the North East Midlands. Find her at www.emmapass.com or follow her on Twitter @EmmaPass. The Fearless: An army, powered by an incredible new serum that makes each soldier stronger, sharper, faster than their enemies. Intended as a force for good, the serum has a terrible side-effect – anyone who takes it is stripped of all humanity, empathy, love. And as the Fearless sweep through the country, forcing the serum on anyone in their path, society becomes a living nightmare. Cass remembers the night they passed through her village. Her father was Altered. Her mother died soon after. All Cass has left is her little brother – and when Jory is snatched by the Fearless and taken to their hellish lair, Cass must risk everything to get him back. Acid: The year is 2113. 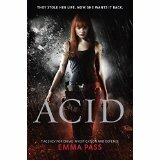 In Jenna Strong’s world, ACID—the most brutal controlling police force in history—rule supreme. No throwaway comment or whispered dissent goes unnoticed—or unpunished. And it was ACID agents who locked Jenna away for life, for a horrendous crime she struggles to remember. But Jenna’s violent prison time has taught her how to survive by any means necessary. When a mysterious rebel group breaks her out, she must use her strength, speed, and skill to stay one step ahead of ACID and try to uncover the truth about what really happened on that terrible night two years ago. They’ve taken her life, her freedom, and her memories away from her. How can she reclaim anything when she doesn’t know who to trust?